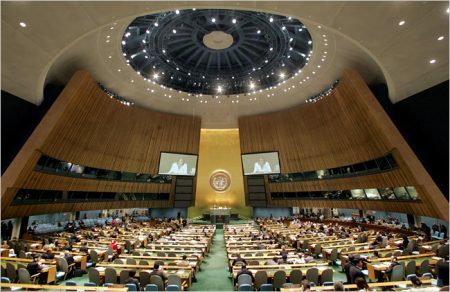 The Social, Humanitarian and Cultural Committee (Third Committee) of the United Nations, on Monday, voted overwhelmingly in favor of the right of Palestinian self-determination. According to Al Ray Palestinian Media Agency, the vote saw 170 countries voting in favor, while seven countries voted against, including Canada, the United, States, Israel, Marshall Islands, Micronesia, Nauru, and Palau. Five other countries abstained from voting. The UN vote re-institutes the right of the Palestinian people for self-determination, including their right for having an independent State of Palestine. The vote also urges all countries, United Nations organizations and other competent authorities to continue in supporting the Palestinian people in their struggle for independence. Following the vote, the Senior Advisor to the Permanent Observer Mission of Palestine to the United Nations, Nadya Rasheed, said that the international support for this resolution sends a clear message to the Israeli state with the need to end its discriminatory policies and violations against the Palestinian people, and its refusal to resolve the two state solution.